As a continuation of my previous host How does NSX virtual switch work I am now writing about how the routing works. I should thank Ron Flax and Elver Sena for walking through this process with me. Ron is learning about what I mean by knowledge transfer and being very patient with it. 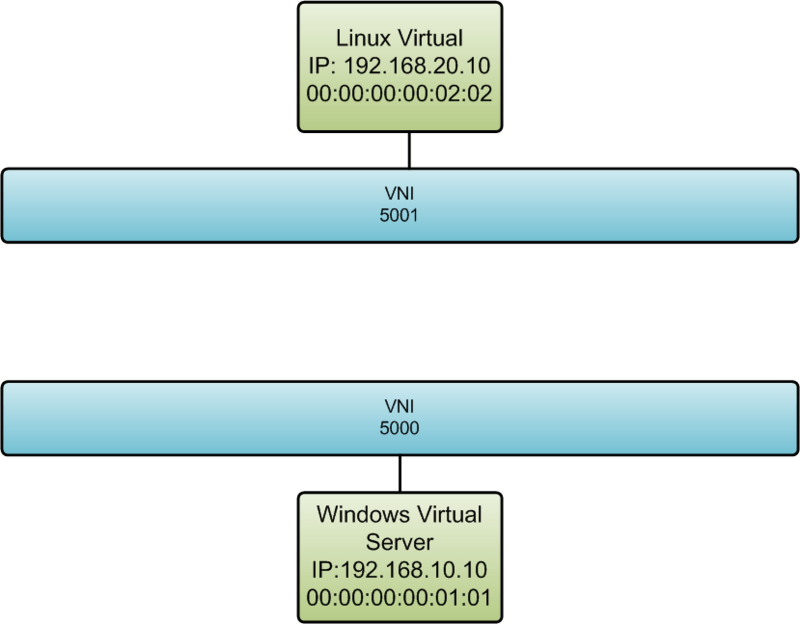 This post will detail how routing works in NSX. The more I learn about NSX the more it makes sense. It is really a great product. My post are 100% about VMware NSX not multi-hypervisor NSX. IP packets continue to forward upward until a router knows how to deliver the IP packet. It all sounds pretty simple. It would be simple if someone placed a IP subnet at a location and never changed it. We could all learn a static route to the location and never have it change. Think of the internet like a freeway. Every so often we need to do road construction this may cause your journey to take longer using an alternate route but you will still get there. I am afraid that the world of IT is constant change. So protocols were created to dynamically update router of these changes standardized exterior gateway protocols were born. (BGP, OSPF etc..) I will not go into these protocols because I have a limited understanding and because it’s not relevant for the topic today (It will be relevant later). It’s important to understand that routes can change and there is an orderly way of updating (think DNS for routing.. sorta). A key component of routing is the internet protocol. This is a unique address that we all use every single day. There are public ip address and internal IP addresses. NSX can use either and has solutions for bridging both. This article will use two subnets 192.168.10.0/24 and 192.168.20.0/24. The /24 after the IP address denotes the size of the range in cidr notation. For this article it’s enough to denote that these ranges are on different layer 2 segments and normally cannot talk to each other without a router. Both of the networks shown would set their default gateway to be the router. Notice the use of distributed router. In a physical environment this would be a single router or a cluster. NSX uses a distributed router. It’s capability scales up as you scale up your environment, each time you add a server you get more routing capacity. Where does the distributed router live? 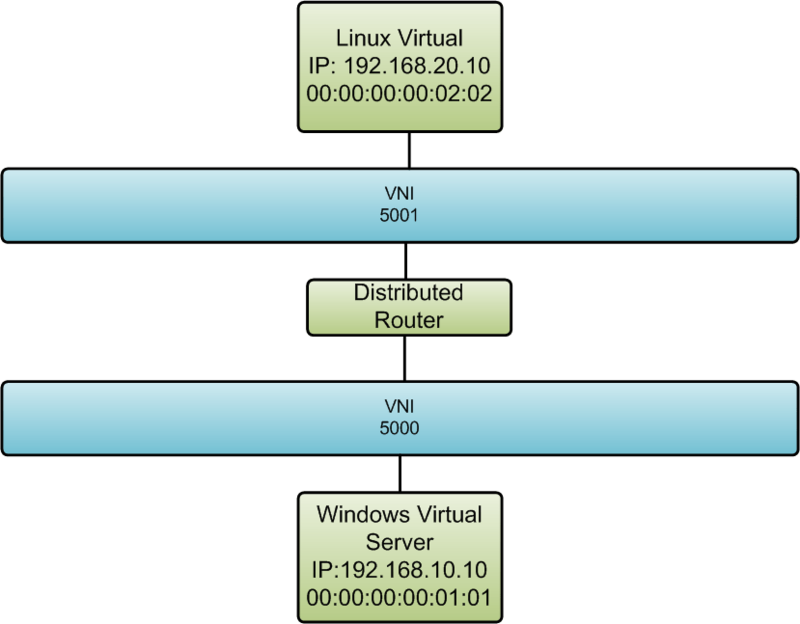 Distributed router – code that lives on each ESXi host as part of the dVS that handles routing. 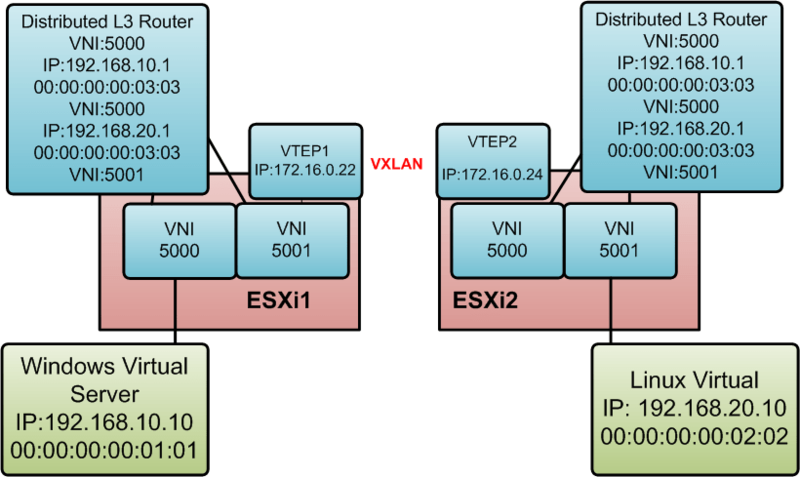 NSX Control cluster – This is the control cluster mentioned in my last post. It syncs configuration between the management and control plane elements to the data plane. How does NSX routing work? Here is the really neat part. A routers job to deliver IP packets. It is not concerned if the packets should be delivered it just fings IP’s to their destination. So let’s go through a basic routing situation in NSX. Assume that Windows virtual machine wants to talk to Linux virtual machine. It really makes sense if you think about it. It works just like any router or switch you have mostly ever used. You just have to get used to the distributed nature. The greatest strength of NSX is the ability to handle everything locally. If Linux was on the same ESXi host then the packet would never leave ESXi1 to get to Linux. What is the MAC address and IP address of the DLR? Yep it’s not a typo each router is seen as the default gateway for each VNI. Since the layer 2 networking is done over VXLAN (via VTEP) each local router can have the same IP address and mac address. The kernel code knows to route it locally and it all works. This does present one problem: External access. In order for your network to be accessible via external networks the DLR has to present the default gateway outside, but if each instance has the same IP / Mac who responds to requests to route traffic? Once instance gets elected as the designated instance (DI) and answers all questions. If a message needs to be sent to another ESXi host than the one running the DI then it routes like above. It’s a simple but great process that works. What if your designated instance becomes isolated? There is an internal heartbeat that if not responded to will cause a new DI election to happen. What about if networking fails on my ESXi host? Well then every other instance will continue to communicate with everyone else, packets destined for the failed host will fail. What about if the control cluster fails? Well since all the routing is distributed and held locally everything will continue to operate. Any new elements in the virtual world may fail but everything else will be good. It’s a good idea to ensure that you have enough control clusters and redundancy as they are a critical component of the control plane. Are you stating every esxi host will have local VNI’s to all the VNI’s in the DC , Please elaborate. That’s the process for communication. Please let me know if you have additional questions. If Linux was on the same ESXi host then the packet would never leave ESXi1 to get to Linux. supposing that I have a non NSX environment with ESXI1 having a DVS with a couple of port group managing “traditinal” VLANs, let say 600 and 700. I know that in this case VMs’ traffic need to be forwarded to the gateway but, deploying a DLR, would be theoritically possible to manage these VLAN in the same way of VXLAN meaning that traffic between VLAN (on the same host) wouldn’t leave the host? What I know for sure that this would be possible using something like vyos or other piece of software able to make routing but I don’t know if this would be possible using NSX. Again….maybe in a real environment this doesn’t make any sense but it is just a theoritical question. It is possible to do this by bridging the VLAN with a VXLAN and making the DLR the gateway for the VLAN. It’s not a great long term solution there are a number of impacts on this choice for example all traffic to the VLAN will go out a single ESXi hosts (designated by the host that is running the control VM) Failure of the control VM will cause traffic to the VLAN to fail until it’s restored so you want fail over control VM. Bridging exists for two use cases physical entities that require VLAN access or for converting current VLAN’s into VXLAN’s without major interruption of services. Thanks for awesome article . My questions is “what will happen if Control VM is powered off” ..will the routing already there work ? ..
1 . Let say i have ESG haviing iBGP with DLR . so when the traffic will come to ESG how will ESG know where to route traffic if DLR is powerwed off. 2. will the DLR lif work if DLR control VM is powered off ? Great questions sorry for the delayed response it got caught in my spam filter. 1. DLR cannot be powered off because it’s distributed it would require all ESXi hosts participating to be powered off. Now if the control VM is powered off and not recovered then control plane distributed routing will fail thus anyt traffic between the ESG and DLR would fail. There are a few workarounds… first put the control VM in active/passive fail over. Second consider default routes for traffic if possible. 2. DLR will continue to work without the control VM but upstream communication to the ESG may be interrupted depending on routing protocol.